This month we will look at the number four, which is the first fully physical number. Through four, we become grounded on this earth. It signifies physical Creation, the power of the four directions and the four elements: Fire, Earth, Air and Water. These sustain all life and remind us of how our planet came to be. Earth began as a renegade fiery rock charging through this solar system. Eventually it reached a place in space where the inertia of its movement and the magnetics of the Sun, as well as other planets in our solar system, caused it to settle into an orbit; the comfortable spot it has held for millennium in the eco-system of this solar system. While the rock cooled, it developed a balanced spin and a steady orbit, and waters that may have been trapped inside or frozen in deep pockets rose to the surface. They formed oceans, ice caps, rivers, lakes and springs. Water filled a large portion of the surface of the now developing planet, while changes of hot and cold, due to the spin and the stretch of the orbit created seasonal and regional climates; thus the planet developed an atmosphere. This created the perfect environment for many life forms. Contained in the number four is the history of earth. In single strokes, four creates a square, the foundation of a building, a protective perimeter, a controlled space; the symbol for the basis of grounded growth. The personal line of creation: physical, emotional, mental and spiritual parts of who we are. The integrating line of creation: the self, the pairing or mating relationship, the progeny and the genetic/dynastic ancestry. The national/patriotic line of creation - identical to the tribal except it, aligns with the government, not ethnic culture. The religious line of creation - identical to the tribal except this aligns with religious beliefs which may be global as in Christian or Hindu, etc; or more specific as in Lutheran verses Catholic. This information helps us explore where we focus and how we ground. Taking time to consider each area will reveal where we are out of balance. 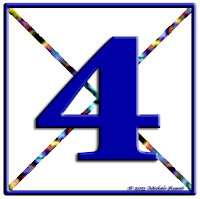 By understanding the areas in our lines of creation, we begin to understand the number four. Bringing issues into balance, we take control of our lives, and thus create personal peace. When we are in harmony with four. we are in total control of our lives. When out of sync with four, we discover an area where we’re telling others what to do and how to do it. We’re taking away someone else’s power of choice, taking on a karmic burden and losing control of our lives. Being the foundation of creation for the human form, and its stability; four asks that we anchor the four elements within ourselves: fire (passion and creativity), with water (emotions, dreams, and sensitivity), with air (thoughts, words and judgments), and earth (actions, and physical health). When each area is in balance, we have peace and happiness in our lives. Here is a simple chant to help bring the number four into balance: “El Ka Leem Om.” Repeat in rounds of four. These are the Sanskrit words for Earth, Fire, Water and Air. By chanting them we call in the Divine Intelligence of each element to bring peace and balance. May carries the frequency of the number three, the number of nurturing. Three is feminine water. It signals the union or separation of two, which results in a third part. Being an act of creation from the two, this third part must be nurtured to grow. May’s energy of Taurian earth, takes the three from watery emotion to practical action. So in May, three is about nurturing the physical body in practical ways. When we satiate the body, we nurture our emotions and mental activity flattens into a peaceful zone. Nurturing the body can be done with food, and physical pleasures of all kinds: massage, swimming, dance, etc. May emphasizes dancing with nature. We may do a Hawaiian hula, playfully celebrate with the May pole, or waltz in the woods. Whatever dance we choose will align us with the four elements and they will ground and balance us with love, compassion, mental clarity and inspired passion. The full numerology of May 2013 asks us to make a conscious choice (6) to nurture ourselves and the earth (3), and to fulfill our choices completely (9). Nine is the perfect number; it encompasses three, threes. While nurturing yourself, you will discover your dreams, and when you nurture your dreams, you will complete both yourself and your dreams. This is the perfect act of completion, which is part of the number nine. Considering the frequencies of May 2013, whose numbers are 3, 6, 9, this month asks us to choose to complete our self-nurturing dreams. It asks us to ask ourselves, “What would I love to do, that I have said, ‘Someday’…” May 2013 contains the energy to ground our…“Someday dreams”… now.